Kalimat pasif / Passive Voice adalah kalimat yang doer/ agent atau pelaku berada di posisi objek dan secara grammatical diawali oleh preposisi by yang artinya oleh. Dan berikut ini adalah contoh 120 Soal Passive Voice dan Kunci Jawaban. Jika kalian belum paham atau masih bingung bagaimana cara mengubah kalimat aktif menjadi pasif, silahkan dibaca lagi Pelajaran bahasa Inggris Passive Voice. Setelah itu kerjakan soal-soal di bawah ini ya... Jangan takut tidak bisa, karena soal sudah dilengkapi dengan kunci jawaban. 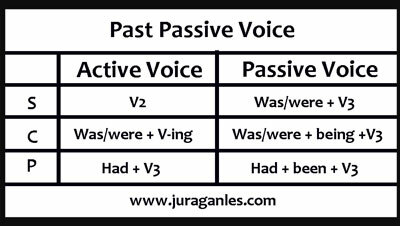 Berbicara tentang passive voice, saya pernah mempelajarinya yang mana passive voice hanya digunakan oleh 8 tenses non continuous dan 2 tenses continuous. 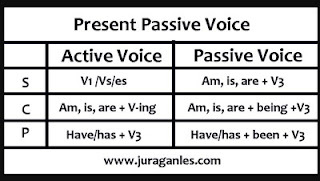 Namun saya juga pernah membaca buku yang mana passive voice bisa digunakan oleh semua tenses (16 tenses). Dan di bawah ini saya bagikan contoh soal passive voice yang digunakan oleh 7 tenses yang paling banyak digunakan ditambah passive voice dengan variasi modal auxiliary. I. Move these sentences below into passive voice ! 2. Rina waters the flowers. 3. Vita finds a wallet. 3. Jonathan is buying some books. 4. He doesn't describe the good painting. 5. Mother has just made orange juice. 6. The farmer is planting the paddy. 7. A teacher has explained the lesson too much. 8. Has a child learnt how to make a paper plane? 9. My sister hasn't translated an English story. 10. Dio embraces Celly tightly. 11. The policemen are guarding the precident. 12. Does the factory produce many kinds of plastic? 13. Are some people cutting those big trees? 14. Have many children fed the cats today? 15. Mr. Farhan is scolding Nandito. 16. Who seldom drinks green tea? 17. How many tickets does Adam buy? 18. Who has paid the tax? 19. Why do the students learn this lesson? 20. What does the cat play? 21. Whose pencil does Talita take for writing? 22. Whom has the teacher advised? 23. Whom does your mother help? 24. Who writes this article? 25. How many magazines have the children torn in the living room? 26. How much water has your sister drunk? 27. Where do they plant the trees? 28. Has Andy stolen your bike? 29. What is father reading? 30. When do they return my book? 1. Apakah uangmu sering digunakan dengan baik oleh keluargamu? 2. Baju-baju itu dijemur di belakang rumahku. 3. Fredy sedang diburu polisi karena kasus narkoba. 4. Kitab suci ini ditulis dalam bahasa Arab, iya kan? 5. Ikan-ikan ini dipelihara di kolamku. 6. Mengapa pelajaran sulit ini sering dilupakan? 7. Mobil siapa yang biasanya diparkir di depan rumahku? 8. Apa yang sedang dimakan oleh kerbau-kerbau ini? 9. Lemari di kamarmu telah dikunci, iya kan? 10. Nama siapa yang belum disebut? 11. Siapa yang sedang dihukum oleh pak Amat? 12. Apakah mereka dibayar setiap bulan? 13. Soal-soal ini dijawab dengan sempurna oleh Bima. 14. Apakah kalung ini sedang dicari hingga sekarang? 15. Anak siapa yang telah diajak ke pesta itu? 16. Siapa yang telah diwawancarai di ruangan ini baru-baru ini? 17. Pelajaran ini baru saja dijelaskan oleh pak Hary. 18. Sepeda rusak itu sedang diperbaiki oleh pak Anam. 19. Sebuah masalah penting sedang didiskusikan dalam rapat itu. 20. Nikita tidak ingin diganggu oleh siapapun. 2. Amanda returned my book last night. 3. My father bought this car last year. 4. They were cutting a big tree. 5. Jono had edited ten articles last month. 6. Marchell was watering the plants. 7. The police picked up them in a cafe last night. 8. The seller offered some discounts to the buyers. 9. Who borrowed your dictionary? 10. Which book did they hide? 11. Whom did Ridho remind? 12. What book was Elma looking for? 14. How many books did Farida cover? 15. Why did the teacher leave the meeting last night? 16. Why did Mr. Rozak scold you yesterday? 17. Whose secretary stole an important document? 18. How many coconuts did Angga send to the market? 19. How much water were the villagers taking on the desert last week? 20. Where did Anita bring those kittens? 1. Monas dibangun pada tahun 1986 oleh Presiden Souharto. 2. Perhiasan bibiku telah dicuri tadi malam. 3. Gedung-gedung tua itu diledakkan seminggu yang lalu. 4. Temanku sedang diwawancari oleh pemilik perusahaan tadi pagi. 5. Sapiku dibeli oleh seorang perempuan yang baik hati hari Minggu lalu. 6. Apa yang sedang dibicarakan oleh mereka semalam? 7. Apakah mobilmu sedang dicat jam 8 kemarin? 8. Buah apa yang sedang diperas oleh kakakmu ketika aku datang tadi malam? 9. Apa yang sudah dimakan oleh adik perempuanmu kemarin? 10. Baju-baju siapa yang sedang dijemur di atas rumput kemarin siang? 1. A manager will interview the applicants next week. 2. My father will buy a paddy field tomorrow morning. 3. Hasnah will tell intersting story in front of audience. 4. The commitee will hold a beautiful contest next month. 5. Mrs. Dani will punish Reno if he doesn't do his homeworks. 6. Will visitors read all my articles? 7. When will she return my money? 8. Whose boy will she love? 9. What will they look at? 10. Who is going to guide us? 1. Pesan anda akan dijawab segera. 2. Suratmu akan diposkan besok pagi. 3. Apakah candi ini akan dipugar lagi? 4. Teman lama biasanya akan terlupakan. 5. Nomormu akan diganti secepatnya. 6. Kertas-kertas ini akan dibakar besok pagi. 7. Apa yang akan dibangun di kotaku? 8. Akankah dia tertipu lagi? 9. Siapa yang akan dianugerahkan sebagai siswa terbaik? 10. Siapa yang akan ditemui ayahmu nanti malam? 1. They can finish the homeworks well. 2. My father is able to fix this radio. 3. Lastri has to sweep the floor everyday. 4. They must be able to apply the rule. 5. Anto might visit this house last week. 6. Must they remind you? 7. Could Arman invite a singer to entertain us? 8. Who can operate this machine? 9. What do the students have to buy? 10. How many books does Anggita have to cover? 1. Kebutuhanmu tidak harus dipenuhi oleh orang tuamu. 2. Bahasa Inggrismu harus diperbaiki. 3. Barang-barang antik bisa ditemukan di museum. 4. Sampah harus dibuang di tempat sampah. 5. Barang-barang ini harus dikirim tepat waktu. 6. Bolehkah tas-tas mahal ini disimpan di lemariku? 7. Berapa waktu yang bisa digunakan sebaik mungkin? 8. Haruskah pekerjaan-pekerjaan itu dikerjakan dengan segera? 9. Buku mana yang boleh dibaca oleh mereka? 10. Mengapa anak-anak seharusnya bisa dibimbing oleh orang tua mereka? 1. They are visited by Rudy. 2. The flowers are watered by Rina. 3. A wallet is found by Vina. 4. Some books are being bought by Jonathan. 5. Orange juice has been made by mother. 6. The paddy is being planted by the farmer. 7. The lesson has been explained by a teacher too much. 8. Has how to make a paper plane been learnt by a child? 10. Celly is embraced by Dio tightly. 11. The precident is being guarded by the policemen. 12. Are many kinds of plastic produced by the factory? 13. Are those big trees being cut by some people? 14. Have the cats been fed by many children today? 15. Nandito is being scolded by Mr. Farhan. 16. By whom is green tea seldom drunk? 17. How many tickets are bought by Adam? 18. By whom has the tax been paid? 19. Why is the lesson learnt by the students? 20. What is played by the cat? 21. Whose pencil is taken by Talita for writing? 22. Who has been advised by the teacher? 23. Who is helped by your mother? 24. By whom is this article written? 25. By how many magazines have been torn by the children in the living room? 26. How much water has been drunk by your sister? 27. Where are the trees planted by them? 28. Has your bike been stolen by Andy? 29. What is being read by father? 30. When is my book returned by them? 1. Is your money often used well by your family? 2. Those clothes are dried behind my house. 3. Fredy is being hunted by the police because of drug case. 4. This holy book is written in Arabic language, isn't it? 5. These fish are maintained in my fishpond. 6. Why is this difficult lesson often forgotten? 7. Whose car is usually parked in front of my house? 8. What is being eaten by these buffaloes? 9. Cupboard in your bedroom has been locked, hasn't it? 10. Whose name hasn't been called? 11. Who is being punished by Mr. Amat? 12. Are they paid each month? 13. These questions are answered perfectly by Bima. 14. Is this necklage being looked for until now? 15. Whose child has been invited to that party? 16. Who has been interviewed in this room recently? 17. This lesson has just been explained by Mr. Hary. 18. That broken bike is being fixed by Mr.Anam. 19. A urgent problem is being discussed in that meeting. 20. Nikita doesn't want to be disturbed by anyone. 1. Grandmother was visited by Anton. 2. My book was returned by Amanda last night. 3. This car was bought by my father last year. 4. A big tree was being cut by them. 5. Ten articles had been edited by Jono last month. 6. The plants were being watered by Marchell. 7. They were picked up by the police in a cafe last night. 8. Some discounts were offered by the seller to the buyers. 9. By whom was your dictionary borrowed? 10. Which book was hidden by them? 11. Who was reminded by Ridho? 12. What book was being looked for by Elma? 13. By whom were you disappointed? 14. How many books were covered by Farida? 15. Why was the meeting left by the teacher last night? 16. Why were you scolded by Mr. Rozak yesterday? 17. By whose secretary was an important document stolen? 18. How many coconuts were sent by Angga to the market? 19. How much water was being taken by the villagers on the desert last week? 20. Where were those kittens brought by Anita? 1. Monas was built in 1986 by president Soeharto. 2. Jewerly's aunt had been stolen last night. 3. Those old halls were burst one week ago. 4. My friend was being interviewed by the owner of company this morning. 5. My cow was bought by a kind woman last Sunday. 6. What was being talking about by them last night? 7. Was your car being painted at 8 o'clock yesterday? 8. What fruit was being extracted by your sister when I came last night? 9. What had been eaten by your younger sister yesterday? 10. Whose dresses were being dried on the grass yesterday afternoon. 1. The applicants will be interviewed by a manager next week. 2. A paddy field will be bought by my father tomorrow morning. 3. Intersting story will be toll by Hasnah in front of audience. 4. A beautiful contest will be held by the commitee next month. 5. Reno will be punished by Mrs. Dani if he doesn't do his homeworks. 6. Will all my articles be read by visitors? 7. When will my money be returned by her? 8. Whose boy will be loved by her? 9. What will be looked at by them? 10. By whom are we going to be guided? 1. This message will be replied soon. 2. Your letter will be posted tomorrow morning. 3. Will this temple be restored again? 4. Old friend usually will be forgotten. 5. Your number will be replaced immediatelly. 6. These papers will be burnt tomorrow morning. 7. What will be built in my town? 8. Will she be deceived again? 9. Who will be awarded as the best student? 10. Who will be met by your father tonight? 1. The homeworks can be finished well by them. 2. This radio is able to be fixed by my father. 3. The floor has to be swept by Lastri. 4. The rule must be able to be applied by them. 5. This house might be visited by Anto last week. 6. Must you be reminded by them? 7. Could a singer be invited by arman to entertain us? 8. By whom can this machine be operated? 9. What has to be bought by the students? 10. How many books have to be covered by Anggita? 1. Your necessity doesn't have be fulfilled by your parents. 2. Your English must be improved. 3. The antiques can be found in the museum. 4. Rubish must be torn in the dustbin. 5. These goods must be sent on time. 6. May these expensive bags be stored in my cupboard? 7. How much time can be used as good as possible? 8. Must those works be done soon? 9. Whose book may be read by them? 10. Why should the children be able to be guided by their parents? 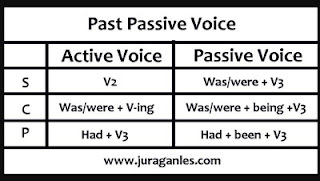 Itulah 120 Soal Passive Voice dan Kunci Jawaban yang bisa saya bagikan. Semoga bermanfaat. Jika ada kesalahan pada kunci jawaban, mohon koreksinya. Terima kasih. 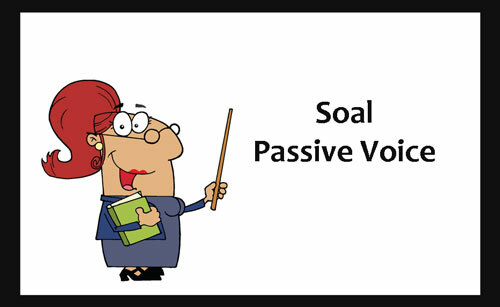 Pertanyaan tersebut adalah Active Voice untuk menanyakan objek. Artinya adalah Siapa yang ibumu bantu? BUKAN Siapa yang membantu ibumu? Coba bedakan dengan Who helps your mother? Who pada pertanyaan adalah untuk menanyakan subjek yang artinya Siapa membantu ibumu?